The Qatar Foundation Stadium ... 45,000 capacity. With the 2022 Fifa World Cup now well and truly in Qatar’s court after much controversy over the legitimacy of its bid, the nation looks set to go ahead at full throttle to put in place the infrastructure needed to support this prestigious event. Qatar’s construction sector is well on a trajectory of continued exponential growth with big-ticket projects such as its $40-billion railway and metro programme, $8-billion new port, $4-billion stadium plan, ambitious expressway programme, mega reservoir scheme, hotels and malls all planned for completion over the medium term and certainly by the D-day set by the World Cup tournament. The nation’s budget for last year – its largest ever – earmarked QR87.5 billion ($24 billion) for large-scale projects, a 16.8 per cent increase over the previous year. It made way for large spending on infrastructure projects such as bridges, tunnels, public transport, the metro and roads as well as electricity, water and sanitation systems. Despite the plunging oil prices, Qatar appears undeterred in its expansion programme and is expected to push ahead with its infrastructure plans this year as well. Meanwhile, according to the Qatar Economic Outlook 2014-15, the construction sector was projected to expand by 14.1 per cent last year, up from 13.6 per cent in 2013, and is expected to accelerate faster in 2015.
Business Monitor International (BMI) forecasts average real growth in the construction sector of 9.8 per cent between 2015 and 2023. According to the BMI’s latest infrastructure report on Qatar, the country’s construction industry performed extremely strongly over 2014, and the numerous large-scale infrastructure that have entered construction such as the Doha Metro and further elements of Doha’s new port, will keep growth rates elevated over 2015. Qatar’s spending on infrastructure over the next decade has been estimated at between $150 billion and $206 billion, given the associated facilities that will be required to host the thousands of spectators that will be drawn to the mega event. BMI’s Infrastructure Key Projects Database estimates that some $67-billion transport projects are at the planning stage and under construction. In the transport sector, the Doha Metro project has been going full steam ahead, making headlines practically every month over the past year, with a number of key projects announced over the period. This project, which has already seen contracts worth a whopping $32 billion awarded, will continue to be a source of business for the construction sector (see separate article). Another key sector is energy and utilities, in which Qatar’s government plans to invest $22 billion up to 2020, according to the Qatar Electricity and Water Company (Kahramaa). BMI also indicates that the residential and non-residential building sector will be a major driver of growth in Qatar’s construction industry over the long term, with developers building major projects, encouraged by the public sector efforts to boost infrastructure and the momentum set by the World Cup. Demand for residential property has surged over the past year with rents reported to have increased 20 per cent, against a backdrop of the influx of foreign professionals and workers recruited to implement the country’s mega infrastructure projects. The Peninsula newspaper quoted a real estate expert as saying that last year was one of the best for the industry with prices witnessing a 10 to 20 per cent increase. However, the nation is already facing capacity constraints in terms of building material and labour shortages, and is battling escalating prices. Demand for cement in Qatar is projected to double within the next three years. Growing demand by the construction sector for cement and metals is expected to encourage investment in new capacity, prompting growth of the manufacturing sector. Qatar has also faced severe criticism for its labour policies and has had to take immediate attention to address global concerns. Last May, it unveiled plans for labour reforms which include replacing a contentious sponsorship law known as “kafala” – in which migrant workers need their employer’s permission to change jobs – with a system based on employment contracts. Under further labour reforms proposed, workers will have their wages paid electronically to avoid late payments and the country would adopt a “unified accommodation standard”, a measure aimed at improving the quality of migrant workers’ housing. Another bonus of hosting the world-class event is that Qatar is making determined efforts to develop codes and standards to promote sustainable construction, aimed at minimising energy and water use as well as carbon emissions of buildings. The country has issued a new set of construction specification, which will focus on worker safety as well as durable and sustainable construction (see Regional News). Over the past year, numerous contracts have awarded for work on the 231-km Doha Metro. The metro will have four lines and is to be executed in twin stages with Phase One involving a 131-km stretch and 48 stations. Phase Two will see the construction of a 100-km track with 44 stations. Phase One is on course to open in 2019. Under one of the latest deals, a joint venture of the US-based Louis Berger won a $79-million contract to provide project management consultancy (PMC) services for all elevated and at-grade sections of the project (see Regional News). Another recent contracts worth $609 million went to a consortium comprising Korea’s Lotte Engineering & Construction, Rizzani de Eccher of Italy and Redco of Qatar is to build the Red Line North (elevated and at-grade). Another recent deal was awarded to the Dutch architectural firm UNStudio, which was appointed to design more than 30 stations for the first phase of the network. Last year, design-and-build contract for the Red Line South Elevated and At-Grade went to the FYAP joint venture consisting of FCC Construccion, Yuksel Insaat, and Archirodon Construction (Overseas). The design-and-build contract for the Green Line (elevated and at-grade) meanwhile, was awarded to the SPH joint venture consisting of Saudi Binladin Group, Porr Bau and Hamad Bin Khalid Contracting. Prequalification bids have also been invited for the 510-km long distance freight and passenger railway. Work is also in progress on the Light Rail Transport (LRT) project in Lusail, where the main civil works of seven underground stations and all the excavation works have been completed. The LRT project comprises four operating lines, totalling 33 km of network and including 37 stations. It will also be connected to the Doha Metro Red Line North via two main stations (see separate report). Meanwhile, a consortium including French industrial groups Vinci and Alstom has signed a €2-billion ($2.72 billion) contract with Qatar Railways Company to build a tram system for the city of Lusail. Qatar’s Public Works Authority (Ashghal) has projects worth some QR40 billion ($11 billion) in progress under its ambitious Expressway Programme. Among the key road projects under way are the 45-km New Orbital Highway, 9.9-km Dukhan Road (East), the 5.3-km Lusail Expressway, the East-West Corridor, the North Road corridor and the Al Wakrah parallel road extension project (see separate report). Meanwhile, the new Al Wajbah underpass, part of the newly constructed Al Wajbah interchange of Dukhan Highway Central Expressway project, has been completed. Work is now under way on five 2022 Fifa World Cup venues that are in different stages of construction, according to The Peninsula newspaper. Al Rayyan Stadium, which is being demolished, will be rebuilt to increase seating capacity from 22,000 to 40,000. In addition, construction work is in progress at four other venues. 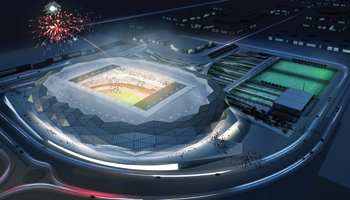 This includes enabling works at Al Wakrah Stadium and Qatar Foundation Stadium, which is in the detailed design stage; early works at Al Bayt Stadium in Al Khor City; and main construction works at Khalifa International Stadium, which will increase the seating capacity to 45,000. Work on Al Wakrah and Al Bayt stadiums is set to be completed in 2018. A joint venture of Midmac Contracting and Six Construct is responsible for the work on Khalifa stadium. Meanwhile, designs for four new stadiums – Qatar Foundation Stadium and Health and Wellness Precinct, Khalifa International, Al Wakrah and Al Khor stadiums – were unveiled recently. The Qatar Foundation Stadium in Education City will have various facilities that will help it serve as a centre for community events including classrooms offices, conference rooms and health clubs in addition to sporting facilities. The 45,350-seat stadium will be located in the midst of several university campuses. Qatar has so far awarded construction contracts worth a total of $4.22 billion for its New Port project, located south of Doha, which is expected to be completed by 2020, according to The Peninsula. The project includes a new port, a new base for the Qatar Emiri Naval Forces and the Qatar Economic Zone Three. Once the first phase is completed in 2016, the port will have a capacity to receive two million containers. Its full capacity is expected to reach six million containers with the completion of the remaining two phases. The steering committee of Hamad International Airport is looking to initiate the second phase of the airport expansion project, with the design contract anticipated within the last quarter of this year. The airport will be the focal point of Qatar’s proposed Airport City, which is still in the concept design stage. The multi-billion-dollar project, spread over an area of about 10 sq km, will feature four circular zones – Business District, Aviation Campus, Logistics District and Residential District. The Silver Pearl Hotel ... 1,000 plus rooms of luxury in Doha. A host of new hotels will be built to accommodate football fans who will attend the World Cup, among the most ambitious of which is the $1.6-billion Silver Pearl Hotel which will be a 1,000 plus-room luxury property to be located 1.5 km offshore near Doha. Pending approval, the project will be developed by Katara Hospitality, a leading Qatar hotel developer and operator. The building will consist of two semi-circular 30-storey towers separated by a vaulted, climate-controlled atrium over lush gardens with an open view to the ocean beyond. An adjacent structure will house a conference and exposition centre as well as a recreational landscaped roof deck to be located above a multi-storey parking facility. Among other projects, work is currently under way on the Hilton Panorama Residence at the Abraj Quarter precinct of The Pearl-Qatar development. According to First Qatar Real Estate Development Company, which will be investing up to $390 million in the project, construction will be completed by mid-2017. Qatar’s private sector is also focusing on building residential, commercial and retail facilities to cope with demand. Among the striking projects proposed is the Parisian-inspired QR5-billion ($1.37 billion) mixed-used development in Lusail City, by United Developers, excavation work on which has been completed. The project, Place Vendôme, will host two five-star hotels, serviced apartments, up to 400 retail outlets, and a central entertainment component. At least two mega shopping malls are currently being built in Qatar. These include the Mall of Qatar, which is expected to be completed by the year-end (see separate article). Construction is also ongoing on the Doha Festival City Mall, under a QR1.65-billion ($453 million) contract awarded to a joint venture of Gulf Contracting Company (GCC) and Alec Qatar. A number of new hospitals under construction within the Hamad Bin Khalifa Medical City are expected to be completed and fully equipped by the middle of this year, according to Ashghal. Work is also under way on the expansion of two hospitals – Hamad General Hospital’s emergency department and Al Khor Hospital with an additional 500 beds. Another major project on the anvil is a mass casualty trauma hospital in the north of Doha. The 1,100-bed hospital is slated for completion in 2022, one year later than initially scheduled. According to the Supreme Council of Health (SCH), 11 new hospitals and medical research facilities are expected to be built in Qatar by 2022.